Las Palmas de Gran Canaria, better known as Las Palmas, is a Spanish city of the Autonomous Community of the Canary Islands. 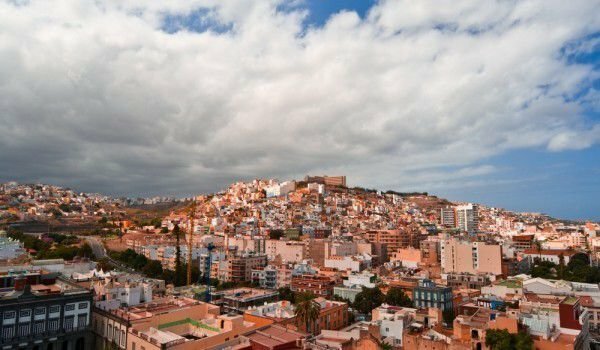 The population of the city of Las Palmas is 383, 308 people. Las Palmas is recognized as the largest city of the European Union, which is located outside of Europe. Las Palmas is a popular tourist destination because of its beauty and attractive climate which its inhabitants enjoy with warm weather all year round. It is estimated that Las Palmas is the city with the best climate for tourists worldwide. Las Palmas was founded as a city in 1478 and the seventeenth century, it performs the function of the capital of the Canary Islands. Today Las Palmas is the capital of Santa Cruz. The town was founded by Juan Rejón, as its original name was Real de Las Palmas. In his first trip to America, Christopher Columbus anchored in the port city of Las Palmas. The town has a museum dedicated to Christopher Columbus. At the end of the sixteenth century Francis Drake tried to conquer the island, but failed. Then he attacked the Dutch city and partially destroyed it. In 1927 the city was recognized as the first capital of the Canary Islands. In 1936, the coup of General Franco starts from Las Palmas and led to the civil war in Spain. In Las Palmas is a variety of theaters, opera there, regularly held concerts and dance performances. The city hosts the annual music festival in the Canary Islands and the International Film Festival. The Carnival of Las Palmas is famous worldwide and is one of the main attractions for tourists. The city has many historical landmarks. Museum Canario was founded in 1879. The museum presents a valuable collection of archaeological objects found in the Canary Islands, which are set out in sixteen rooms. The museum has a library of over sixty thousand volumes. Columbus Museum presents the history of the Canary Islands and their relations with America. In the museum there are thirteen permanent exhibition halls, a library and study center as well as a room for temporary exhibitions. In the museum complex billing is the house where Columbus stayed during his first trip to America. Museum Elder is dedicated to science and technology. It is equipped with innovative interactive technology. The Maritime Museum undergoes expansion as of right now, upon its completion, the building will have a huge pool, which simulates an interactive bay with a large vessel operated by visitors. The Atlantic Centre of Modern Art, opened in 1989, is one of the most important places for the cultural life of the Canary Islands. This is a place for permanent and temporary exhibitions, ranging from the historical and the avant-garde, to the latest trends. Theatre Peres Galdós was built in 1867, but was almost completely destroyed in 1928 by fire. It was restored. There are many other theaters. Great concerts are held in the city’s auditorium Alfredo Kraus, which covers an area of 13, 200 square meters. The palace of Congress extends over a 16, 000 square meter area. The city has a large network of libraries. In the city of Las Palmas is regularly conducted a Jazz Festival, as well as an opera festival. The town hosts a film festival for fantasy and horror films.